We were based in Alex Walker’s Serian South mobile camp. (This camp is amazing—ask me about it if you’d like to know more!) We had scheduled a walk with them one morning during our stay. A walking safari is a great way to get out of the vehicle, stretch your legs, and learn about the little things that are quite fascinating. We weren’t sure what to expect, but ended up with a diverse group. 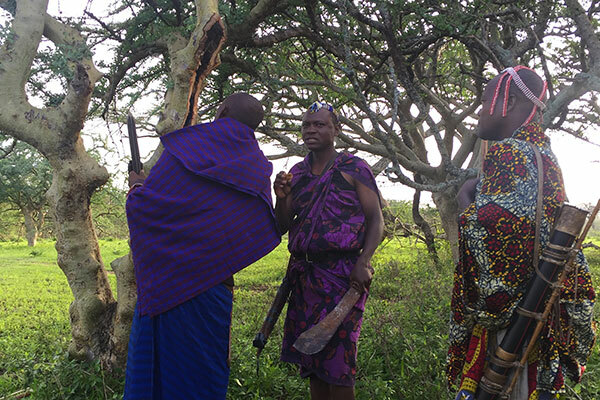 Hadzabe members Chololo and Gunga, and Maasai members Sadala and Lonyoike, walked with us; our guide came along to translate and an armed ranger escorted us. 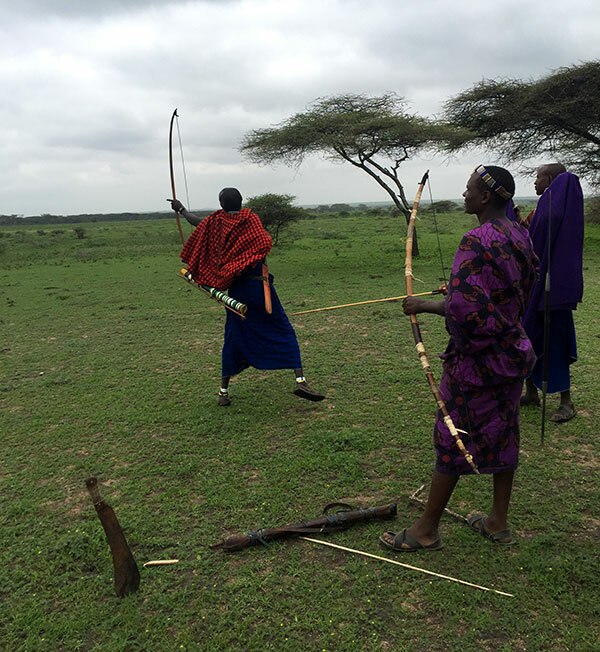 Most importantly, the Maasai and Hadzabe used their honed bush survival skills to help us avoid things like biting ants, wild elephants, and snakes. 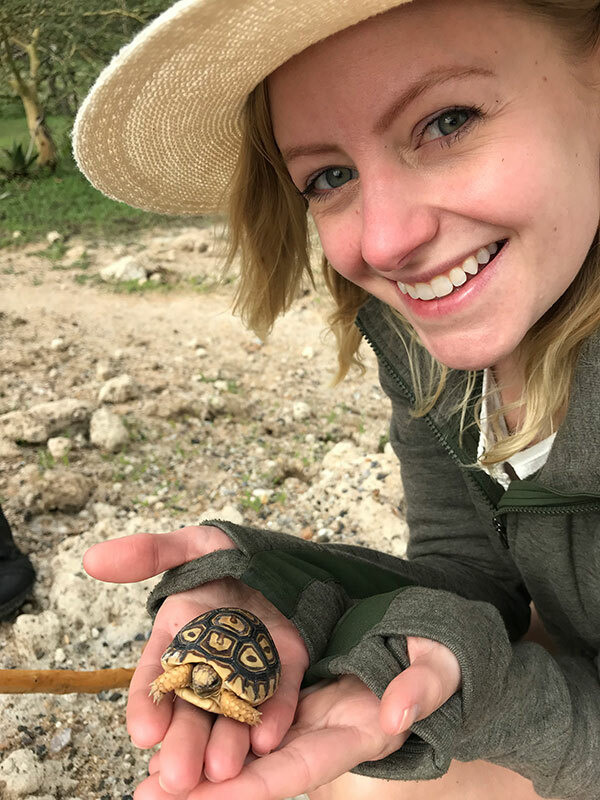 But they also found wild honey inside a tree trunk, showed us how to make a bush toothbrush, and found a baby leopard tortoise that we would have missed otherwise. We followed a group of elephants, and they knew to place us down wind so the animals couldn’t pick up our presence. And Nick tried shooting their bow and arrows. It was an incredible experience! Who knew a tortoise could be so cute? But wait, it gets better! 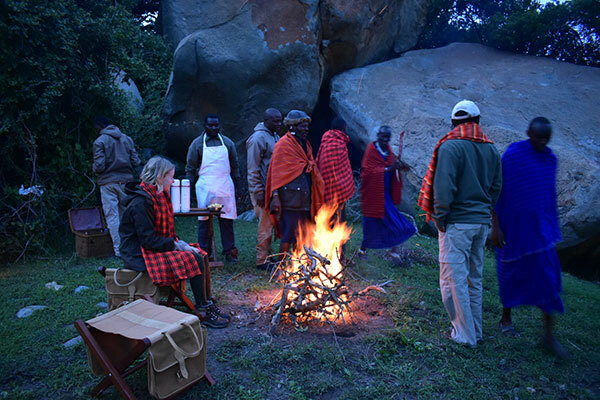 The prior evening we had been to a Maasai Kopje (rock outcrops that dot the Ngorongoro Conservation Area) for sundowners and visited a cave that acts as a meeting place for the Maasai when special decisions need to be made. That evening, we drove back to the Kopje for a surprise bush dinner. 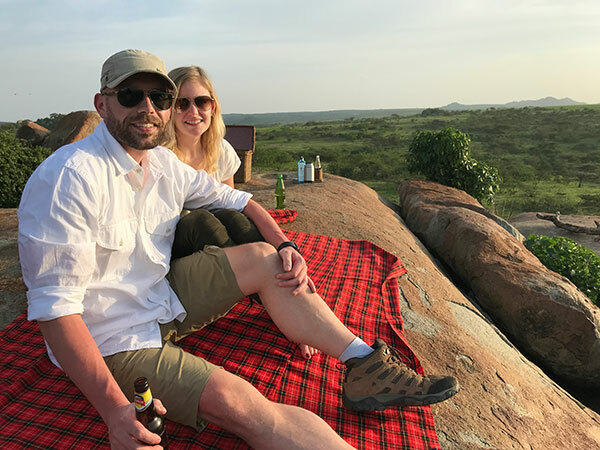 Sundowners at the Kopje in Tanzania—the view out over the bush was amazing! It started with drinks around the fire, some friendly banter (they all wanted to know how many cows Nick had paid for me), and a blessing by the elder, Nyuki. 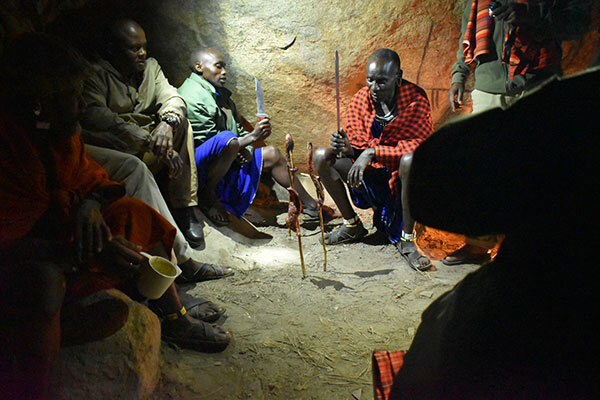 Unfortunately, the rain was beckoning, so we all retreated into the cozy Maasai cave to finish the evening’s festivities. After a 3-course meal cooked over the fire and a few of the local Kilimanjaro beers for Nyuki, and plenty of wine on our end, it was story time. Story time progressed to song and dance, and Nick had to prove his skills to Nyuki as a Maasai dancer. We both smiled ear to ear all night. 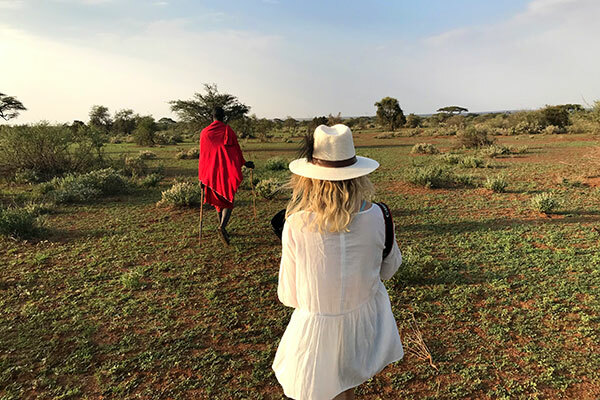 If you are looking to dig deeper and develop the kind of cultural connection that only comes with time, I challenge you to walk with the Maasai and Hadzabe, mimic the bush ways, and camp remotely. It will diminish language barriers, open your eyes to details missed otherwise, and forge new ways of thinking. What are you waiting for? If you’d like to learn more, please email me or give me a call at 888-367-0933 and I’d love to help inspire your next adventure! You can also use our trip planner to browse Tanzania vacation packages.